There has been some discussion about Measure J/R over the past year – with the basic question “does it work as intended?” The recent passage of two measure J/R votes (Nishi and West Davis Active Adult Community) has demonstrated to some that the community-wide vote requirement can work. While there are others that have the view that yes Measure J/R can work, but the process required by the ordinance is faulty. 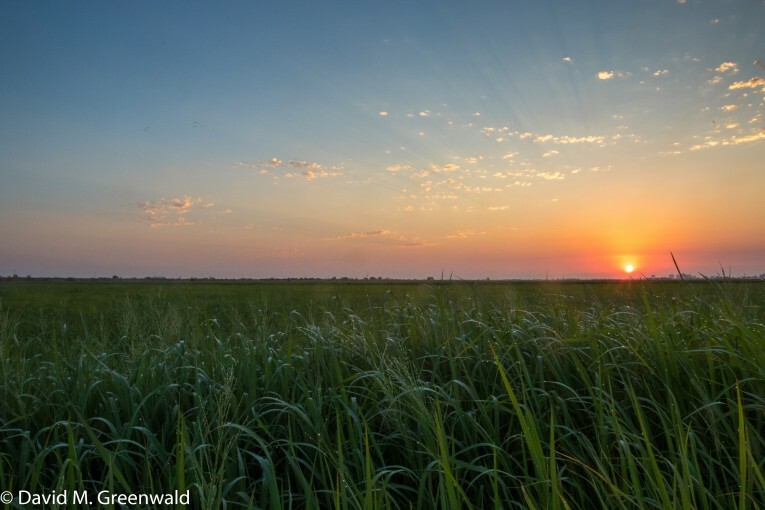 Many people who have written or expressed their concerns about the Measure J/R process have focused on the cumbersome nature of bringing a vote to the community (project description detail, project agreements, full environmental impact report, etc. ), the added costs of bringing a vote to the community (election costs, actual campaign costs, etc.). In addition, some have expressed concerns about the election process itself-the asymmetry in campaign resources makes it hard for all voices to be heard as well as the variety of misinformation, intentional or not, that can make it hard for the public to make an informed choice based upon the merits or lack of merits of the project. For these reasons, some wish to be rid of Measure J/R altogether, while others want a “better” Measure J/R. I would say that for me, the focus on evaluating the success or failure of Measure J/R should not primarily be looking at the five previous Measure J/R community-wide project votes (Covell Village, Wildhorse Ranch, Nishi 1, Nishi 2, WDAAC) but rather what would have happened in the absence of Measure J/R? As a somewhat relevant example to what I am asking, I personally believe that what was proposed to us for the Cannery Project would have been much better if it had had to go over the hurdle of a community-wide vote. As it was, on a split 3-2 City Council vote it was approved with no voter requirement. From my perspective, J/R would have meant a better project proposal for the community. To me, Measure J/R is an important mechanism to ensure high quality proposals for potentially community-changing projects. As far as a “better” Measure J/R? Better is in the eye of the beholder; the details will be all important in what the proponents of “better” actually do propose for us to determine if it really is “better.” Better for the community? Better for the developer? Better for the voter? Just what exactly is this “better” that they are referring to? *We must acknowledge that Measure J/R also means that some projects that would be good for our community never come forward (projects with thinner margins, as well as small projects that have no way of covering the costs of a community wide vote). Overall, I believe that Measure J/R has generally served us well. I am glad we have it. Hello Mayor Lee, recently there are a few situations where people petition for changes. A problem with petitions is that the city council does not necessarily hear those that do not want changes (a petition of 1000 signatures say nothing about whether there are also 1000 opposing signatures unless you know the total number of possible signatures). Is there some way that the city could look into a simple way of getting a poll on an issue, not as any legally binding vote, but as a quick and inexpensive way to get the temperature of an issue? I think Next Door allow something like that for public agencies. It obviously won’t include everyone, but it could be better than nothing. When people see how others would vote and comment on their reasons, people can see the concerns of one another, no one can exaggerate any issues, and there is no need to put anything to an actual vote until the city sees that the people had already discussed among themselves. Measures J/R have led to exactly what you would expect restrictions on the supply of housing to do. It has brought a shortage of housing, huge increases in prices, densification leading to more conflicts,higher rents taking more of peoples money, more debt being carried by students leaving the university, declining enrollment in our schools and additional vehicle miles traveled for those working in Davis but living in Woodland, West Sac, Dixon, Vacaville or Winters. The people it has benefitted are the existing real estate holders, the landlords and homeowners who can sell out when their kids graduate high school. As for the Cannery, I have friends who like living there. Ron assumes a direct cause and effect between Measure J/R and the conditions he has listed. Life is far more complex than the simple model Ron lays out. Looking at his list . . . It has brought a shortage of housing — There is a shortage of housing throughout the State of California, as well as huge portions of the whole United States. Measures J/R have had nothing to do with all those “other” housing shortages. huge increases in prices,– Housing prices have seen huge increases throughout the State of California, as well as huge portions of the whole United States. Measures J/R have had nothing to do with all those “other” price increases. densification leading to more conflicts — Again a phenomenon that is not restricted to Davis. The densification in Davis is much more a function of increased housing demand than it is due to a restriction in housing supply. Arguably the increase in Enrollment at UCD is a much more direct cause for additional densification than the presence of measures J/R. higher rents taking more of peoples money — Higher rents is happening throughout the State of California, and the rate of rent increase in Davis is virtually identical to statewide rent increases. Measures J/R have had nothing to do with all those “other” higher rents. declining enrollment in our schools — If an argument is only as strong as its weakest link, citing declining school enrollment is the vulnerability of Ron’s argument. The principle reasons for declining enrollment in the schools are first and foremost (1) a lack of jobs in Davis that have a sufficiently high enough wage level to support young families, (2) decreased family sizes, (3) the 79% increase in the Davis population aged 55+ from 2000 through 2010. All three of those reasons are individually exponentially larger than Measures J/R on DJUSD schools enrollment. and additional vehicle miles traveled for those working in Davis but living in Woodland, West Sac, Dixon, Vacaville or Winters. — Ron is just being silly with this one. For someone who lives in Woodland and works in Davis, the number of vehicle miles they travel is unaffected by the presence or absence of Measures J/R. If Measure R is not renewed in 2020, the number of vehicle miles for that person will be unchanged. Bottom-line, there are a myriad of factors that impact the items in Ron’s list. It is far from single-threaded. Similarly, the creation of the Mace Mess was the result of a myriad of factors. Bob Dunning’s simplistic approach to Mace is as flawed as Ron’s simplistic approach to his list of factors. Many (not all) of the supporters of J/R process, fell ‘entitled’ to tell others how much we should exact for them to develop their property… and get their entitlements. Extortion. Possible violation of Fifth Amendment as to restricting/’taking’ property of individuals by ‘the state’ (City voters). Bill, I don’t dispute your “exacerbated” assessment . . . for some, but not all of Ron’s markers. For example, Measures J/R haven’t impacted the choice young couples have made to have fewer children/smaller families. Measures J/R haven’t impacted the decisions that college/university students have made vis-a-vis incurring debt to fund their higher education. With that said, you and I strongly disagree with respect to your “extortion” point. Extortion is the practice of obtaining something, especially money, through force or threats. Measures J/R clearly do result in additional expenses for a developer; however, the City (and the community) don’t receive any payments as a result of any of the provisions of Measures J/R. The additional developer dollars are paid out (discretionarily) to third parties, like election campaign consultants, and advertising channels, and experts providing testimony, etc. My personal opinion is that the most important aspect of Measures J/R is that it makes it very hard for our local government to unilaterally approve those kind of give aways. If Cannery had been approved with a Measure R vote, when New Home Company came back to the City one year after the project approval, “asking” for that $8 million “change” to the agreed-upon terms, staff and Council would have had to prepare the appropriate/relevant documentation for the voters explaining why that $8 million supplemental payment was warranted/legitimate. They also would have had to explain to the voters why they were incurring $2 million in bond closing costs and annually paying 6% interest costs each year for 30 years. Bill, blackmail is a demand for something (see “the action, treated as a criminal offense, of demanding payment or another benefit from someone in return for not revealing compromising or damaging information about them”). Blackmail exists regardless of how the victim responds. Extortion is the actual (see “the practice of obtaining something, especially money, through force or threats”). To have extortion you must have receipt or obtaining through a transaction. If the victim refuses to succumb to the threat, then no extortion exists, only blackmail. If the victim does succumb to the threat, then both blackmail and extortion exist. So your readers’ digest summary should read … blackmail is a ‘threat’… folk under ‘threat’ generally don’t want to find out if it is ‘real’… they cave to the threat, even if it is not “real”… blackmail is often a “bluff”… but still, blackmail… extortion is added when/if a payment is made. I look forward to hearing about the holes. Matt Williams’ points in his post [“Ron assumes a direct cause and effect between Measure J/R and the conditions he has listed. Life is far more complex than the simple model Ron lays out. Looking at his list . . .”) all seem spot-on well-supported by the evidence. The argument that has been frequently pushed by David Greenwald/Davis Vanguard and others that Measure J/R is responsible for the housing shortage and housing price increases in Davis does not hold up when we look at the larger regional, state, and national context. I pulled the data together very quickly and looked to see the large picture that it was telling. One key big picture conclusion for the region: Places that have grown rapidly such as Roseville that has added housing units at an annual rate more than 3 times the regional average (Davis has been very close to the regional average) are also at the upper end of rent and housing costs increases. That should serve as a cautionary tale about hoping that you can try to use supply to drive affordability. One thing to keep in mind is that, while supply/demand effects apply to housing markets, housing supply is local (in that it happens (or not) in specific locations), but housing demand is regional. Housing markets are very complex and we shouldn’t just think of one housing “market”, but multiple overlapping housing markets that are heavily influenced not only by local factors, but also by regional and national economics. That is one reason why context is important. If Davis’s housing supply has been “only” growing at a 0.5% rate, it is a completely different thing to look at that fact on its own and draw the conclusion that “it’s the fault of the growth policies” vs. demonstrating that United States as a whole, California, the 4-county Sacramento MSA region, as well as neighboring communities such as Woodland, Dixon, and Solano County have all been growing at around that rate. Davis experienced one of the lowest rates of rent increases in the region from 2011-2018. The city of Roseville had the distinction of having the highest rate of rent increases while it also had the highest rate of housing unit construction. It is often said in certain quarters that an increased housing supply is needed for greater housing affordability [For example, see this article published two days ago in the Davis Vanguard that called housing construction “the engine of affordability”: https://www.davisvanguard.org/2018/10/commentary-cant-build-blocked-litigation-rent-control-answer/%5D However, in Roseville’s case it is clear that the engine of housing construction has gone hand-in-hand with the highest rate of rent increase in the region. 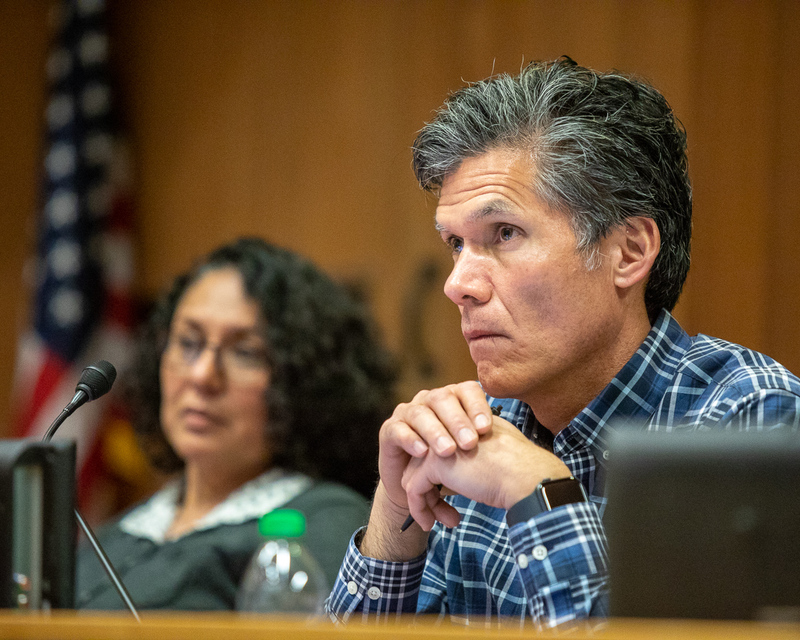 Similarly the Davis Vanguard and the development community in Davis often make statements suggesting that the City of Davis’ growth management land use policies make housing less affordable. The data shown in this article demonstrates that this simplistic viewpoint is misleading. 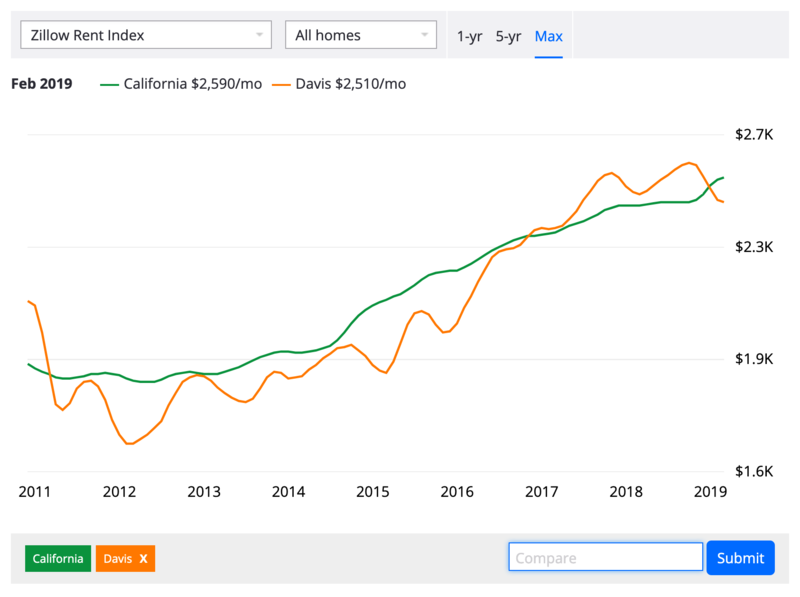 While the housing supply in Davis has grown at rates similar to the region as a whole, Davis has experienced rent increase rates much lower than the regional average. Davis also experienced THE lowest rate of housing value increase in the region from 2011 to 2017. This reinforces the above point and calls into question the idea that growth constraints in Davis have led to large housing price increases. Meanwhile, communities such as Elk Grove, West Sacramento, and Rancho Cordova that had some of the highest rates of new housing construction also had the highest rates of housing price increases. Regarding “Ron”, I’m jokingly wondering if one of us should be referred to as the “anti-Ron”, since our views regarding Measure J/R are polar opposite from each other. Or, we could just include the initial for last names, going forward (if needed for clarification). Of course, the nice thing about Measure J/R is that it provides an ability for all voters to weigh in – regardless of where they are in the spectrum, as well as the benefits/drawbacks of specific proposals. Actually Matt I was riding with another dad on a field trip the other day who is in the process of buying a house in Woodland because it is cheaper than Davis. Both he and his wife have PHD’s, he works for a biotech in Davis, his kids are in our schools. For him this is not some abstract problem it is a hard kitchen table family budgeting issue. I know many people like him who are educated, employed, tax paying, married, family people with kids who would like to live in Davis but choose to live outside Davis for economic reasons. This is a direct result of Measure R.
Ron, you hit the nail on the head when you say “… but choose to live outside Davis …” Where they choose to live is a choice, and they are the ones who make that choice. They are not excluded from living in Davis. They choose to spend their money on other life style choices rather than housing. As Mick and Keith have often said, you can’t always get what you want, but if you try sometimes, you just might find you get what you need . Actually I’m quite serious Matt. If someone who works in Davis but buys in Woodland, or any of these other places, because the premium for living in Davis has expanded since J/R passed, they will be driving farther than if the marginal increase in prices were less because we would have added more supply and they could have afforded to buy in Davis. Ron, the decision on how many vehicle miles one travels to work is made by the homeowner, not by either Measure J or Measure R.
Taking your example of the two PhDs. They have the choice of how high or low their VMTs are going to be. They have the discretionary ability to structure their budget in any of a myriad of ways. If they choose to allocate their money one way and live in Woodland their VMTs will be higher. If they choose to allocate their money a different way and live in Davis their VMTs will be lower. The choice is theirs. Measures J/R are not making the choice for them. They are making it themselves. Matt you are acting as if J/R doesn’t impact these choices by impacting the supply and demand equilibrium of price. It really seems like a “Let them eat cake” argument. No Ron I’m not saying that. I’m simply refuting your argument that J/R is the ONLY factor that has produced the litany of woes that you listed in your comment. I agree with Bill Marshall that Measure J/R has had some impact on the some of your factors, but in none of them is J/R even the most important of the factors. If it were, then the trends in Davis would be outpacing the comparable trends in the the State. In almost all cases they aren’t. Comparing Marie Antoinette to your PhD friends is patently absurd. The French peasants couldn’t even access cake, much less afford it. Your friends do have access to Davis housing. They have the fiscal capacity to afford Davis housing. They simply have made the unilateral choice to take a different route and deploy their fiscal and physical assets in a configuration that they believe serves them better. Actually you don’t know my friends fiscal capacity. David, I explained that very clearly in my first response to Ron. I’ll be glad to repeat it for you. It has brought a shortage of housing — There is a shortage of housing throughout the State of California, as well as huge portions of the whole United States. The many factors causing that statewide shortage of housing are all more important contributors to the Davis housing shortage. In addition, UCD’s increases in (A) student enrollment, (B) faculty, and (C) staff since 2000 are all more significant contributors to the housing shortage than Measures J/R. huge increases in prices – Housing prices have seen huge increases throughout the State of California, as well as huge portions of the whole United States. In fact, on a percentage increase basis, median housing prices statewide have increased at a higher rate than median housing prices in Davis have increased since 2010.
higher rents taking more of peoples money — Higher rents are happening throughout the State of California, and the rate of rent increase in Davis is virtually identical to statewide rent increases. Measures J/R have had nothing to do with all those “other” higher rents. more debt being carried by students leaving the university — True as stated, but certainly only one of many reasons students have more debt now than students did in prior decades. Tuition increases have outpaced housing cost increases. Student Fees increases have outpaced housing cost increases. It is even possible that food price increases have outpaced housing cost increases. declining enrollment in our schools — In a period when Davis population increased by 8.8% from 60, 308 to 65,622 the birthrate declined over 20% from 625 per year to 497 per year. The per/person birthrate declined even more sharply by 27% from 10.4 per 1,000 residents to 7.6 per 1,000 residents. The important contributors to that change is due to life style choices and aging of the population, not due to Measures J/R. Hello Matt, I followed you and played with Zillow by adding Woodland, Dixon, and West Sacramento. For these other cities, both home value and rent are below California average. 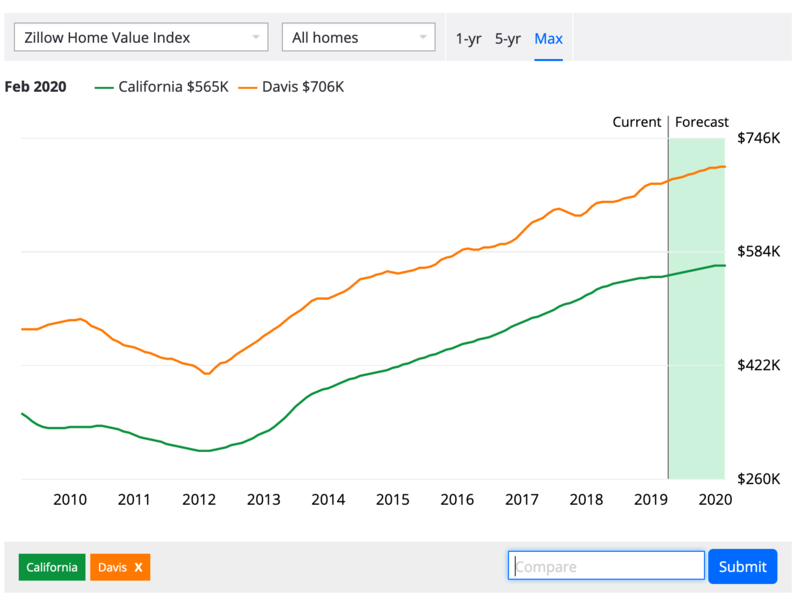 However, only for Davis the home value is at California average. Do you have an explanation other than Measure J/R? Where is the data for age? Do we count students? Yes Edgar, I do have an answer. Davis is a University town, Woodland, Dixon and West Sacramento are not. — In a University town, the identity of the town is both shaped by and complementary to the presence of its university, creating an intellectually stimulating environment enjoyable to all residents, whether they are enrolled in classes or not. — University towns are true melting pots, where young minds meet old traditions, and political, social, and cultural ideas of all kinds are welcomed. — In a University town higher education is the life blood of both economic and social life. — The resident population of a University town is highly educated and ever-changing as students come and go each year. — University towns typically have a high proportion of people in non-traditional lifestyles and subcultures, resulting in a high tolerance for unconventionality. — University towns typically have a very active musical or cultural scene. — In University towns the majority of the population is usually politically liberal. All of those various attributes (and many more) are considered to be key components of a very high quality of life. In all economic spheres, very high quality translates into a price premium for the very high quality goods and/or services. For the most part Woodland, Dixon and West Sacramento have relatively small amounts of those particular quality of life attributes, and as a result they get only a small fraction of the price premium that Davis gets. With that said, Woodland, Dixon and West Sacramento also have quality of life attributes that Davis is relatively short on. The marketplace determines how much of a price premium housing buyers are willing to pay for each respective community’s mix of quality of life markers. Up until Matt replied, I was completely with Ron’s argument. But Ron’s friend chose to take a job in Davis. They also chose to have their children go to Davis schools. So ultimately they chose the life they have now. Matt is a Davis resident, so his opinion matters in defining what Davis is. I have no idea whether his opinion is in the majority or minority. Ron, why can’t your friend move to Davis? Could you convince him by saying that if his family moves here, his opinion might matter more (+2 votes if he and his wife could vote) and help others move into Davis in the future? I would respond by saying that since J/R the premium for living in Davis over the nearby communities has expanded. I agree that J/R distorts the local housing market by adding uncertainty and cost to housing projects. But that distortion pales in comparison to the quality of life distortions that we’d see today had it not been for J/R. Davis would look very different today without it, as staff and Council would have acted more than a few times in response to developer enticements and the clamor for less costly housing. We’d have more than a few Mace Ranches and Wildhorses, and 2008 housing prices would have retreated by 40% like West Sac instead of the 15% they did. We’d have more shopping centers and an even more radically challenged downtown, and the city’s footprint would be much larger than it is today. Choose your poison. I’ll stick with J/R, thanks. I guess some people in Davis would rather be part of the problem than part of the solution. This is no different than much of California but I would ask you about how you would go about lifting people out of the high level of poverty that soaring home prices and rents have caused? Personally I think especially in Davis – the only way to do that is big “A” Affordable Housing. how you would go about lifting people out of the high level of poverty that soaring home prices and rents have caused? If J/R were gone and the CC announced that they would approve any and all housing proposals without restrictions, how many do you think would come forward to address low-income housing? Pretty close to zero is my estimate. We’d end up with hundreds of acres of high-end McMansions bought by affluent Bay Area refugee and Sacramento execs, and we’d still have a low-income housing problem. “So according to the study, by Keyser Marston Associates, every time the city allows 100 new high-end housing units, it needs to build between 20 and 43 new affordable units – just to keep the housing balance the way it is now… In summary, for every 100 market rate condominium units there are 25.0 lower income households generated through the direct impact of the consumption of the condominium buyers and a total of 43.31 households if total direct, indirect, and induced impacts are counted in the analysis. “Meanwhile, new units then take decades to depreciate down to prices actually affordable to most renters (see here also). “Trickle down” isn’t happening fast enough. Even worse, however, new construction actually fuels displacement in the short term – even when no already existing housing is knocked down. Why? Numerous studies show market-rate housing development has price effects on surrounding neighborhoods – driving up rents and increasing the burden on lower-income households. Many residents in communities transformed by gentrification can already attest to the connection between for-profit development, rising living costs, and the mass exodus of lower-income residents…. This is the problem with studies that lack real world insight. Yes, you can argue that market rate housing drive up rents and cost. I don’t happen to buy that because it’s counter-intuitive that more supply would lead to higher prices. But leaving that point aside for a moment, there is also the problem of financing affordable housing without bootstrapping it to market-rate housing. I’m all for finding a way to finance standalone projects but I don’t think it’s realistic. On the other hand, the old pre-J City Councils were approving sucky projects, which is why J/R came about. What is sucky about Mace Ranch, Wildhorse, South Davis or Cannery. The people who live in these places seem happy with the homes they have. I think the problem is that people don’t want more homes for other people. That model only brings perpetual shortage, high prices and poverty.